This Halloween season, Witches are coming out of their broom closets and Zombies are rearing their ugly heads earlier than ever! Time to prepare for these attacks with two powerful bonuses plus a 350 Free Spins! Duke out the mighty forces produced by Witches with help from a 100% 1st Match + 50 Bubble Bubble Spins. Witches will still want to put on a fight and brew their potions, which you can resist with a150% 2nd Match + 100 Witch’s Brew Spins. And don’t forget about repelling a Zombie attack with an effective 200 I, Zombie Spins Reward! The spookiest season of the year is better when you deposit $25 throughout November 15th to fight off zombies and witches with two massive bonuses and Free Spins! Whether you’re looking for thrill-seeking challenge or a relaxing time, you can find it in the underwater reels Uptown! Did you know that the deep-sea waters have a wonderfully calming effect on the mind while at the same time provide a sensation of exhilaration? Find out for yourself when you spin the reels of the new All-Ways-Pays Bonus slot Scuba Fishing! Gear up with your wetsuit, regulator and compensator – time to sink deep into the reels of a colorful game that features serious winning opportunities with Wilds, Multipliers, Jackpots and Bonus features! Let go of your fears and learn to calmly breathe underwater as you collect massive wins in the new Scuba Fishing slot! 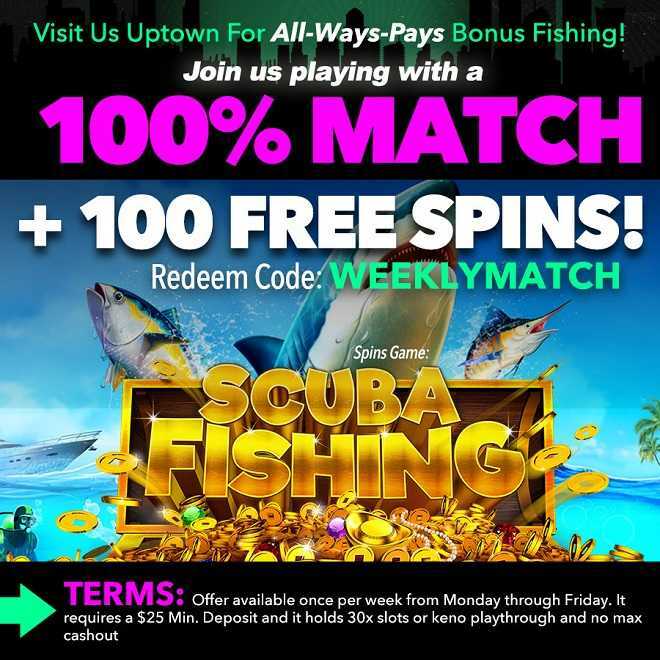 100% Match + 100 Free Spins! Who’s been your favourite witch of all times? Was it the wicked witch of the West? Glinda, the Good Witch? Or perhaps The Sanderson Sisters? Whatever your answer is, we’re sure they pale in comparison to Uptown’s cheekiest witches of al times! 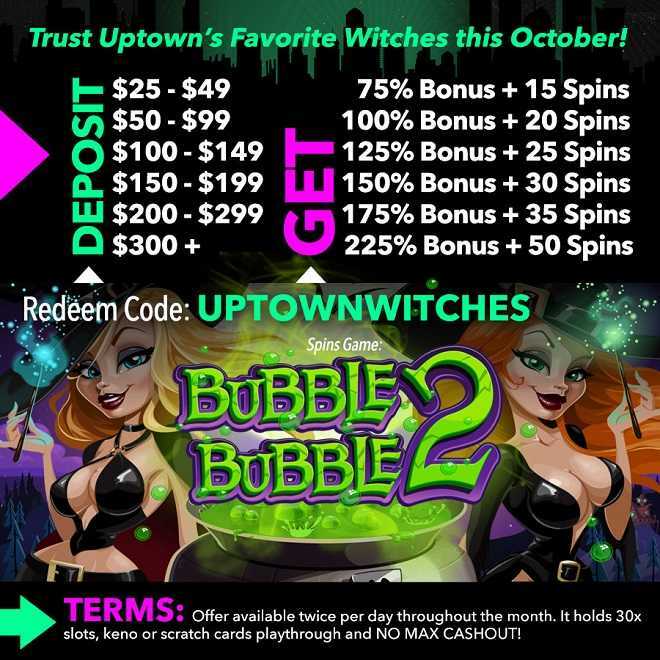 Get to known them again this October as you spin the reels of the popular Bubble Bubble 2 slot with a bonus of up to 225% plus 50 Free Spins! Turn sorcery into wins and celebrate the month of Halloween with your chance to spend some time with the most captivating witches in slots history! Halloween is a time for going all in – so make it count this year when filling your trick-or treat bags with the sweetest of Uptown wins that will be yours with help from up to 100 Free Spins! The tradition of trick-or-treating began in the Middle Ages and it has carried over to modern Uptown times! Join in this Celtic practice and prepare to fill your account with Wild wins, multiplier jackpots and Bonus round prizes! 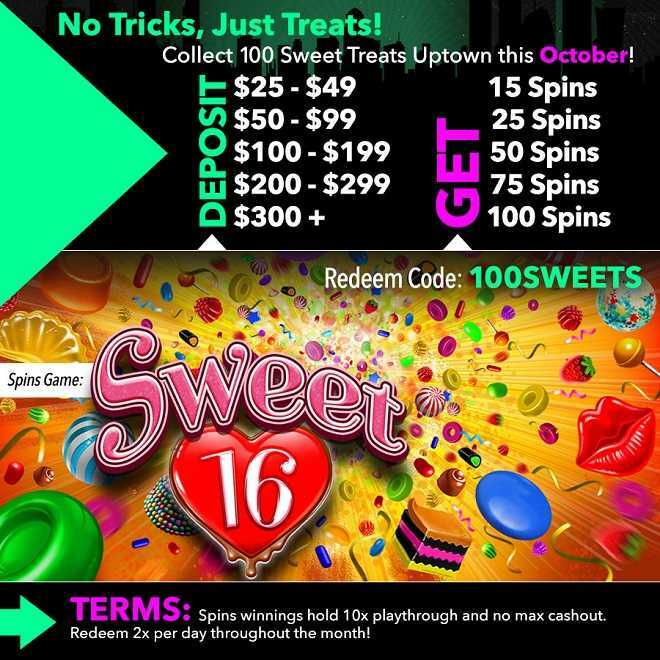 Get ready to get your hands on some sweet October wins when you spin the reels with up to 100 Free Halloween Spins! Collect 100 Sweet Treats Uptown this October! 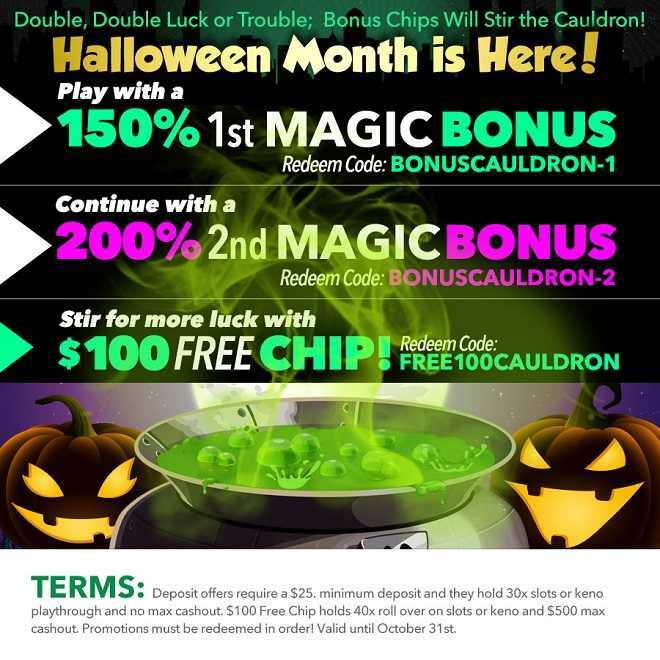 Two Magical Bonuses + a Bewitching $100 Free Chip! This October, the image of a witch brewing a magical potion on Halloween will be replaced with double, double bonuses helping you blend the perfect mix for gargantuan wins! Forget about the pointy hat, the broomstick and the black outfit. It’s all about a cauldron full of bonuses! Deposit $25 and you’ll be stirring double bonuses with a 150% 1st Magic Bonus, then a 200% 2nd Match Bonus and bewitch a $100 Free Chip! Casting and conjuring wins Uptown will be easy with help from Bonus Chips this Halloween! Deposit offers require a $25. minimum deposit and they hold 30x slots or keno playthrough and no max cashout. $100 Free Chip holds 40x roll over on slots or keno and $500 max cashout. Promotions must be redeemed in order! Valid until October 31st.